Hi, I'm new and so far I'm loving it here! I'm enjoying reading the threads and becoming familiar with the forum, and I really loved seeing everyone's bags! As soon as I figure out the thumbnail thing, I'll post pictures of my collection. I could post text links but those aren't as much fun. 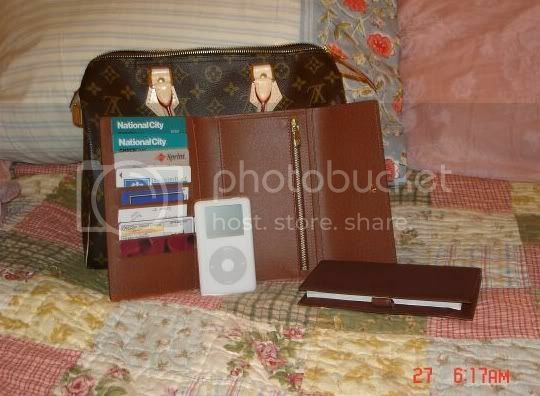 I have the LV Passport Organizer wallet and I absolutely love it. I have several wallets but it's my favorite, hands down. I wasn't sure at first when the SA recommended it, but I'm so glad she did! Here it is closed and open (with my Speedy 30!). So this is my dilemma - I'd love to have something similar and I need some ideas. I can look at bags for hours on end, but not so much with wallets! So far I haven't seen anything that grabs me. Suggestions anyone? Thanks in advance! Well first of all, welcome! You'll find yourself spending more time in front of your computer now that you found this place! I love your wallet! It's something I've been looking for. May I ask what kind of wallet you had in mind, color/style/brand/price range?? Well first of all, welcome! ... May I ask what kind of wallet you had in mind, color/style/brand/price range?? Thank you! I'm having fun so far. As far as the rest...mostly what I'm looking for is something similiar in style, something that will stay flat and neat and not bulk up as soon as I tuck in my cards, bills, change, etc. I've gotten so spoiled with this wallet that I don't want to use anything else! Price...tops maybe 450.00. Either leather or fabric would be fine. No real color preference. 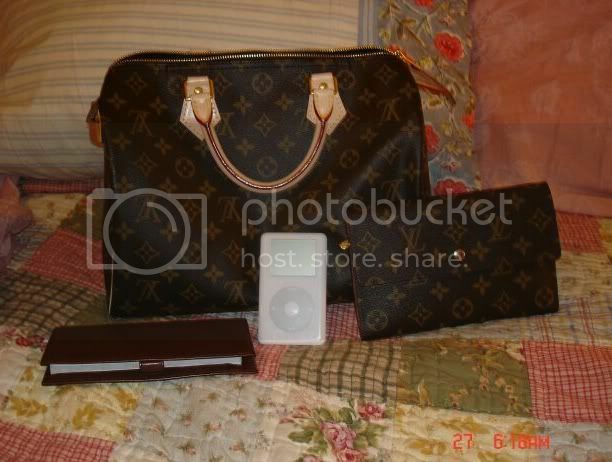 Brand wouldn't matter - Marc Jacobs, another LV, Fendi, etc. I'm easy. Truthfully, I think the style is why I'm having a hard time trying to find what I want. When I've got the wallet in hand, it's almost like a small clutch. It's perfect and I love it but I don't want to use it 'til it's ragged. Though I guess I could just replace it with a new one if I did. It will certainly be like the passport organizer in that it's like a small clutch ! I saw that one the other day! I like zip-around wallets and I love Marc Jacobs - that's gorgeous and I love the hardware. I wouldn't be surprised if I end up with an MJ wallet! Thanks for the suggestion. Here's a thought..obviously not this particular listing but just to give you an idea..maybe in a different color but I think the horsebit gives it a nice touch...? I agree with Ayla, I love that MJ Clutch. I thought I was the only with TWO National City cards in my wallet...You must be from the C-O, I see the Discovery Place card. I memorized my number so I don't even carry mine anymore! I do like Gucci's horsebit hardware, so that's an idea. That's a bit different than the usual tri-fold style, too. Looks like it might have the flatness that I'm looking for. I don't know why I haven't seen more wallets made like my LV passport organizer - maybe it's their background in travel goods? I checked Ghurka but theirs are pretty uninspired - though compared to the bags they're pretty inexpensive! LOL! Busted by my wallet! Yep, two cards, that's how bad I am. One's the joint account with the husband - mine is the one that gets the workout. The MJ is beautiful. If I don't find anything else that I really like, I may end up going with that.